Incredible map of West Africa including a depiction of the apocryphal Lake Aquilunda. This is a 1686 Olfert Dapper map of Central and West Africa. The map depicts the continent from the southern Sahara Desert to Angola and from the Pacific Ocean to the center of the continent, approximately where the Democratic Republic of the Congo and the Central African Republic are situated. Beautifully engraved, myriad rivers are illustrated along the coast, along with numerous settlements and towns. Several settlements are also illustrated and labeled in the Kingdom of Nubia situated on the upper right. Several illustrations of African animals are included as well, such as elephants, ostriches, and lions. Lake Aquilunda, an apocryphal lake believed to be in Angola, is depicted here, with numerous rivers flowing out of it. Dapper consulted numerous sources when compiling Description of Africa, and Lake Aquilunda was widely reported by explorers in their accounts of the region, thus its inclusion here. Eight sailing ships are illustrated in the Atlantic off the coast. A decorative title cartouche is situated in the lower right corner, with a second decorative cartouche in the lower left corner for the scale. 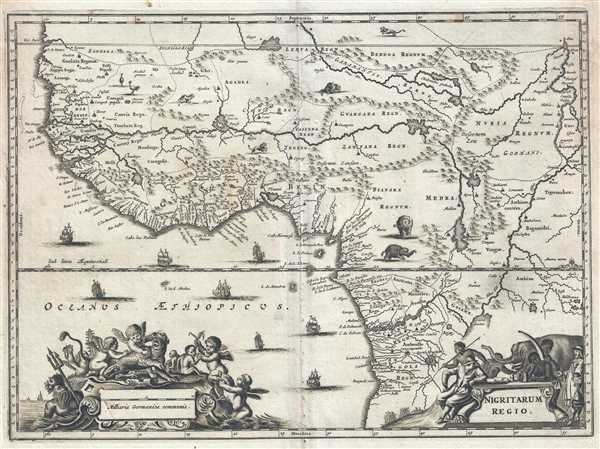 This map was produced by Olfert Dapper and published by in the French edition of Description of Africa entitled Description de L'Afrique and published in 1686. Olfert Dapper (1636 - December 29, 1689) was a Dutch geographer, polyglot, and historian. Born in Amsterdam, he attended the University of Utrecht, where he was registered as a student in 1658. Two years later he began signing doctor medicinæ, but there in no evidence that he ever received any medical training or education. Dapper published a five-volume book about the history of Amsterdam entitled, Historische Beschrijving der Stadt Amsterdam and in 1665 published a Dutch translation from the Greek of the Histories of Herodotus. His best-known work, Naukeurige Beschrijvingen der Afrikaensche gewesten (Description of Africa), was published in 1668 and subsequently published in English by John Ogilby in 1670 and in French in 1686. Although Dapper never traveled to Africa, he took advantage of numerous reports from adventurers in order to compile this authoritative work over the course of three years. Dapper, O., Description de L'Afrique, Contenant Les Noms, la Situation et les Confins de toutes ses Parties, leurs Rivieres, lerus Villes et leurs Habitations, leurs Plants et leurs Animaux; les Mœurs, les Coûtumes, la Langue, les Richesses, la Religion, et le Gouvernement de ses Peuples. Avec Des Cartes des Etats, des Provinces et des Villes, et des Figures en taille-douce, qui representent les habits et les principales Ceremonies des Habitans, les Plantes et les Animaux les moins connus (Amsterdam) 1686. Description of Africa (Naukeurige Beschrijvinge der Afrikaensche Gewesten in the original archaic Dutch), first published in 1668, is an enthographic book which describes Africa. Written by the geographer Olmert Dapper and published by Jacob Van Meurs in two Dutch editions in 1668 and 1676, this work is considered to be one of the foundational works of African studies. Over the course of three years, Dapper consults numerous reports concerning the history and geography of the continent (as it was understood by 17th century Europeans) and travelogues. It is said that Dapper relied heavily on the records of the Dutch West India Company, although none of the original reports have been located by historians. In Description of Africa, per the Fondation Dapper, Dapper, 'far from passing judgement on the societies described and by avoiding ethnocentric connotations, was the first to apply an interdisciplinary approach, adroitly combining geography, economics, politics, medicine, and a study of culture.' Dapper did not write a 'work of exotic curiosities, but a work for posterity.' Description of Africa was published in English by John Ogilby in 1670 and a German translation appeared the following year. A French translation of the work was published in 1686. Very good. Light soiling. Blank on verso.